The International Foundation Programme is a one-year academic programme taught at Cardiff University. It is designed to give you the academic and English language skills needed to enter an undergraduate degree scheme. The Cardiff University IFP is the only foundation programme that offers automatic progression into Cardiff University. Students can also apply for progression to a variety of other courses offered at Cardiff University. 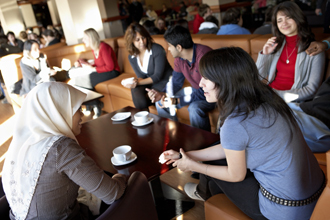 – Classes are taught on campus by Cardiff University staff. – You will be a full member of Cardiff University and benefit from all academic, welfare, social and sporting facilities. – The IFP offers high levels of pastoral care through the dedicated IFP office and system of personal tutors. – University accommodation is guaranteed for the duration of the course. – The IFP office has well-established and successful working relationships with many embassies and sponsorship organisations throughout the world. – You are provided with a comprehensive induction programme including free coach collection services, information events and social activities. *Please note that the English language entry requirement for students wanting to study the IFP in Health and Life Sciences with a view to applying for Medicine is IELTS 6.0, TOEFL iBT 78.